New York, NY. 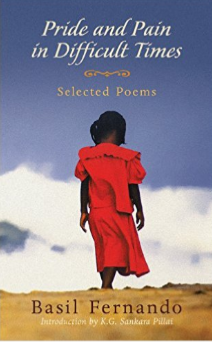 February 11, 2017 – Belle Marquise Books has released Pride and Pain in Difficult Times: Selected Poems by Basil Fernando, a collection of verse that bears witness to one of the most harrowing clashes in South Asian history. Fernando, recipient of the Right Livelihood Award known internationally as the ‘Alternative Nobel,’ brings an utterly human voice to Sri Lanka’s decades-long civil war, evoking the imagery and testimony of a land and people brutalized by a corrupt regime. Part reportage, part literary reflection, Pride and Pain in Difficult Times is a timely ode to Fernando’s homeland and exile. Pride and Pain in Difficult Times: Selected Poems has been hailed by veteran journalist and best-selling author, Bill Hoffmann as, “An insightful and stirring collection…providing an honest and intriguing look into one of Southeast Asia’s deadliest conflicts.” The collection is available digitally and in print worldwide via Amazon.com. About the Author: Basil Fernando is a leading global human rights activist, jurist, author and poet. He is a recipient of the 2014 Right Livelihood Award, Kwangju Prize for Human Rights, has been a Senior Ashoka Fellow and is the editor of Article 2 Magazine. Following a career as a human rights, labor and criminal lawyer with the Sri Lankan Supreme Court, Fernando was inspired by the life and work of Indian statesman Dr. B.R. Ambedkar and Danish philosopher N.F.S. Grundtvig to embark upon a lifelong crusade to defend human rights. With the outbreak of the Sri Lankan civil war, Fernando was further thrust into a pivotal role in addressing judicial breakdown across Asia. He has served as Appeals Counsel for Vietnamese refugees in Hong Kong, which was sponsored by the United Nations High Commissioner for Refugees (UNHCR), and as Senior Human Rights Officer-In Charge of the Investigation Unit under the UN Transitional Authority in Cambodia (UNTAC). He was also Officer in Charge and Chief of the Legal Assistance at the Cambodia Office of the UN Center for Human Rights. He is currently Director of Policy and Programme Development at the Asian Human Rights Commission in Hong Kong, and Executive Director of Asian Legal Resource Centre (ALRC).